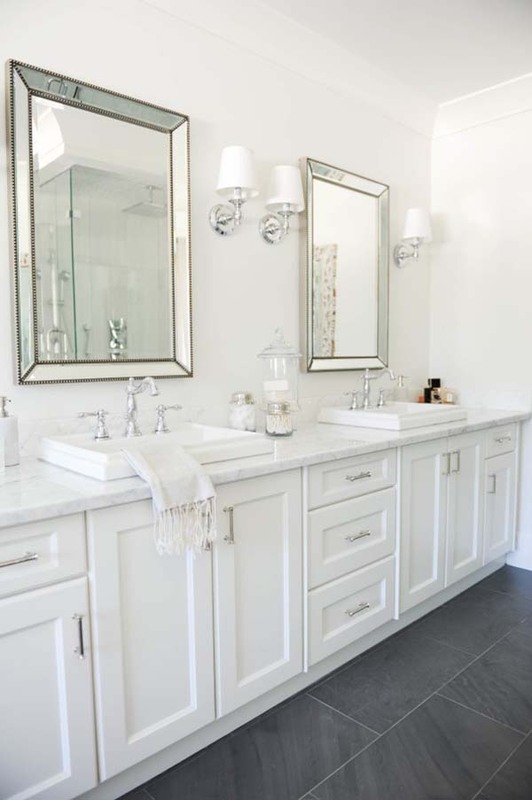 An elegant white bathroom scheme can be a popular choice among homeowners, as the color is associated with clean, relaxing and bright, making your space an oasis of luxury. 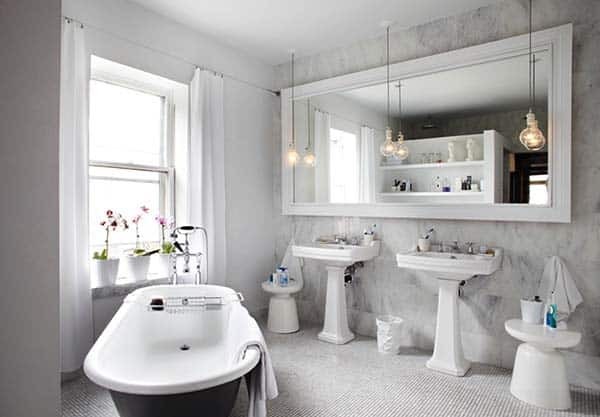 Some people find an all white space to be not their first choice when decorating any room in their home, since it can be stark and not very visually interesting. 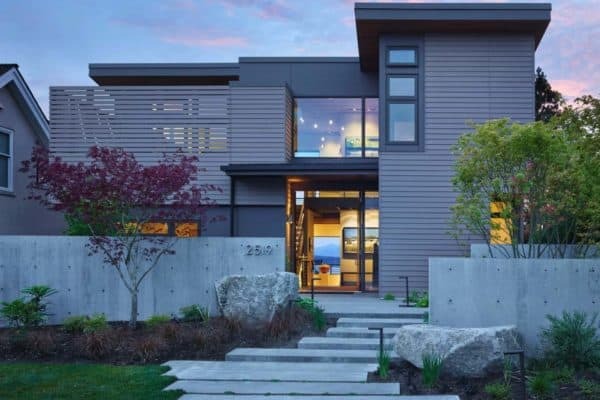 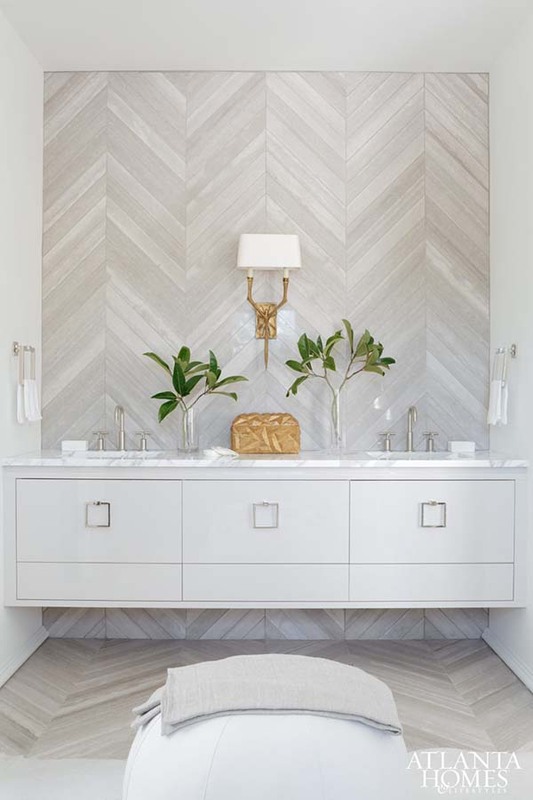 The most important thing to remember if you want to pull of the look is to pay careful attention to your material selection, especially when it comes to textures and sheen. 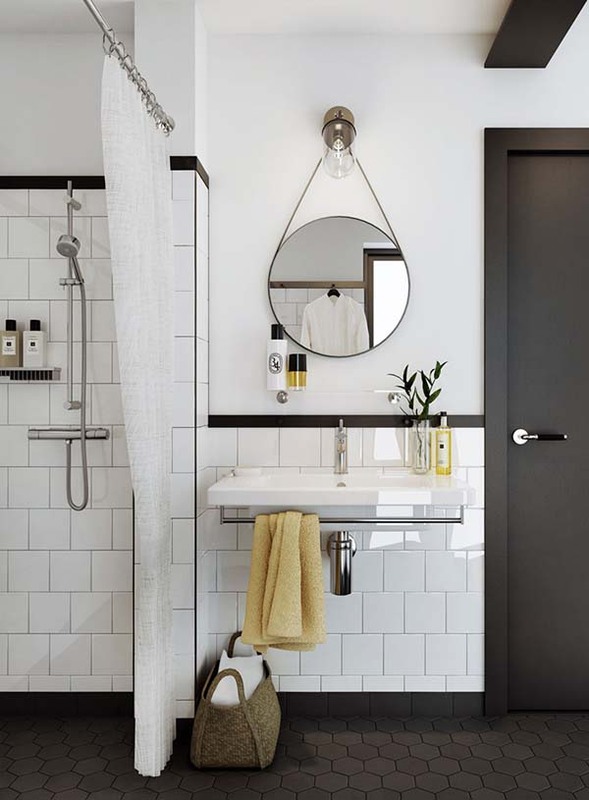 You can also introduce beautiful accessories into an all-white color scheme, since you are pretty much working in a blank canvas. 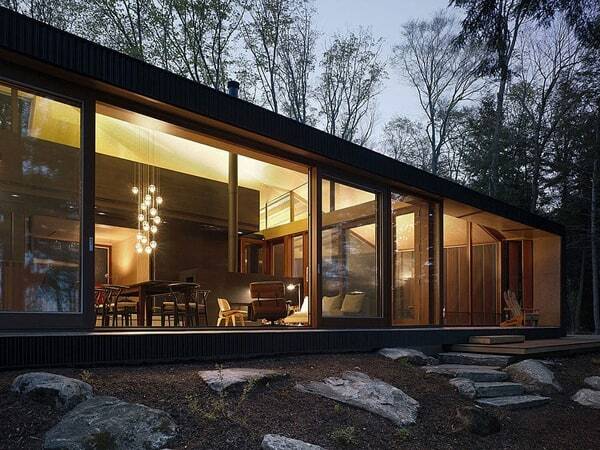 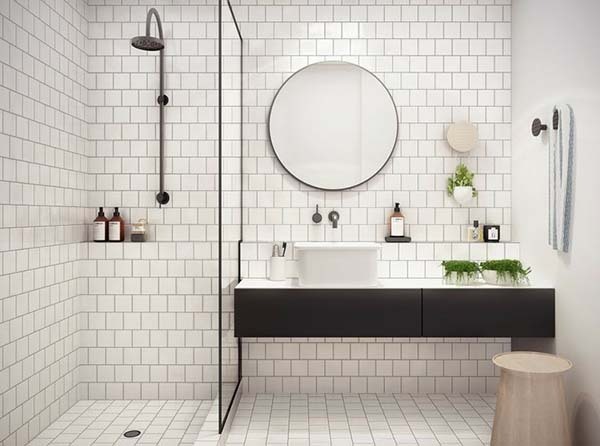 It can actually be an exciting challenge to create a visually interesting space working with a monochrome palette. 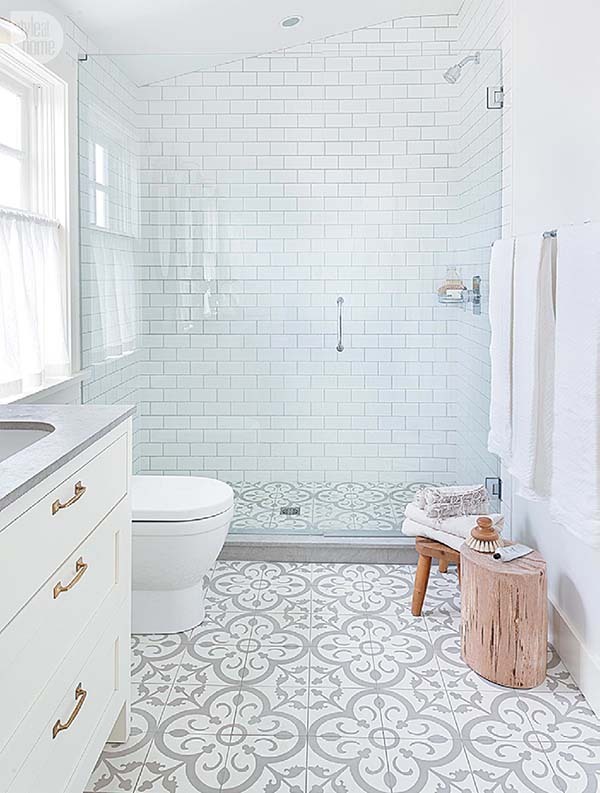 We recommend that you add some patterned tiles, leafy plants, wood elements, or some warm neutral tones to offset the cool undertones. 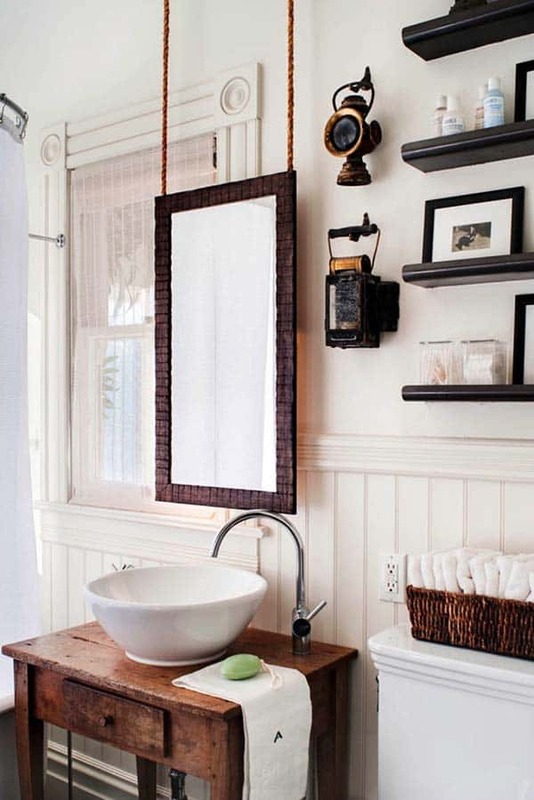 Enjoy the collection of images that we have put together for you with a few great tips along the way. 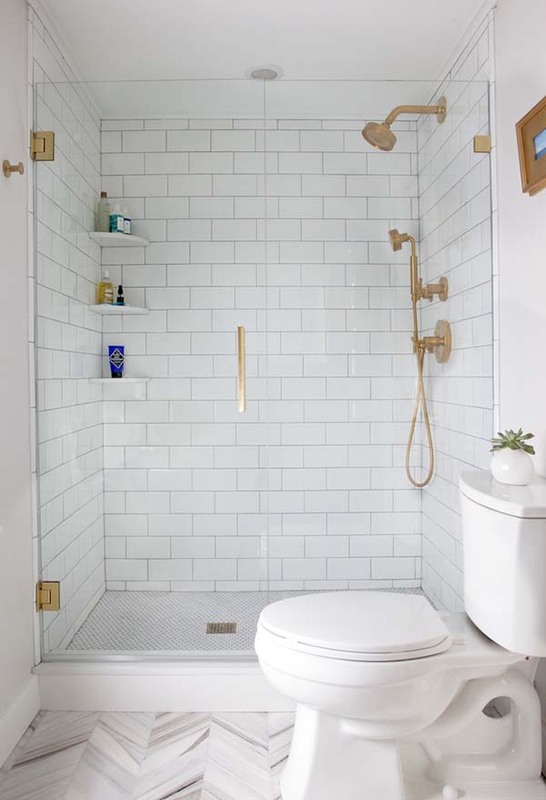 Plus, get more bathroom ideas! 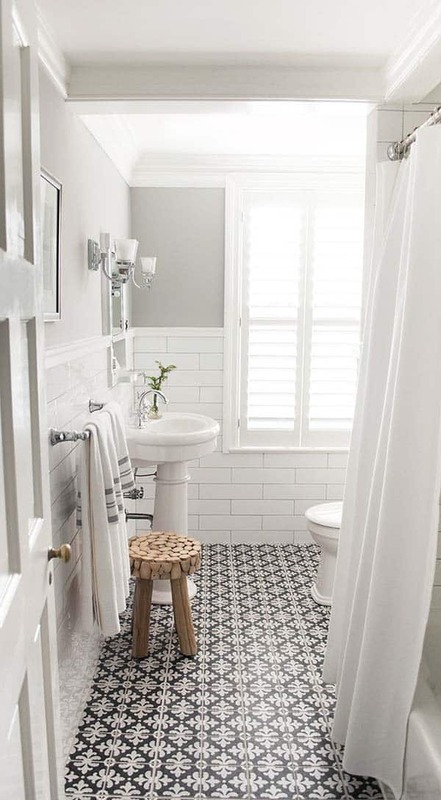 Let us know in the comments section below: Does a white space look visually pleasing, or do you prefer more color in a bathroom? 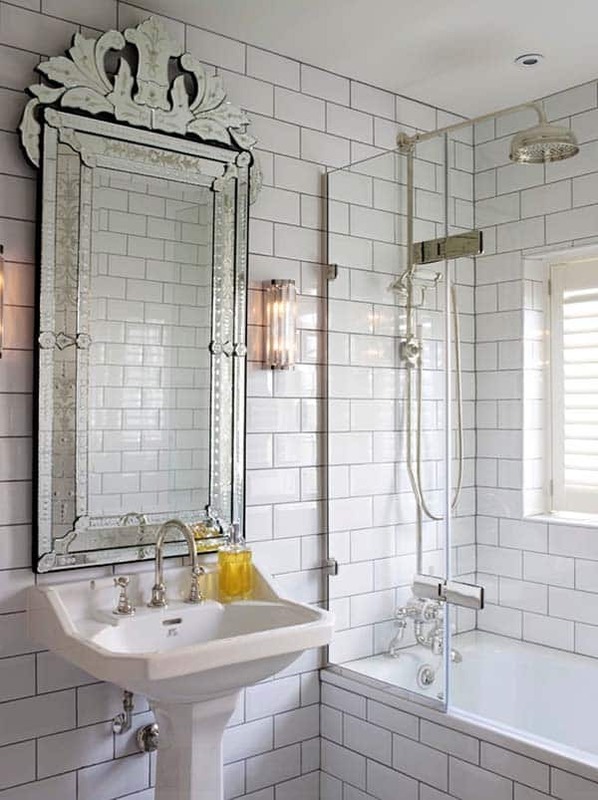 When you have a crisp white bathroom as a backdrop, try dressing it up with some fabulous accessories such as a Venetian mirror with intricate detailing. 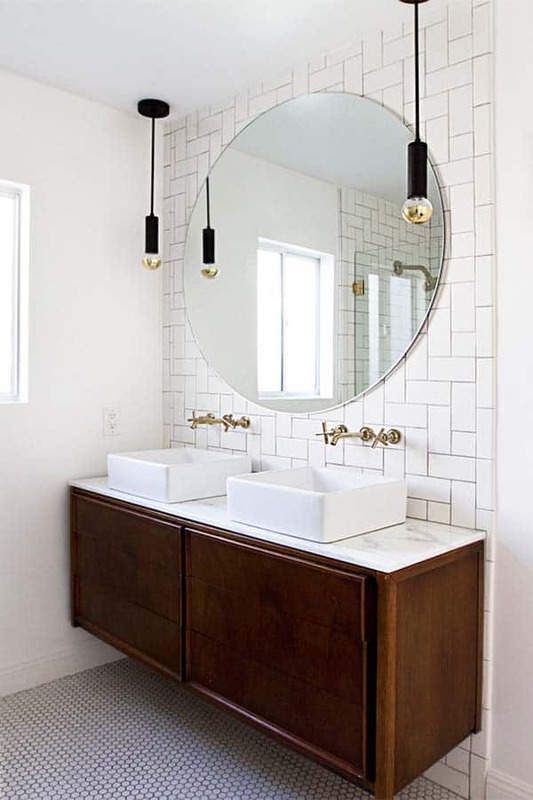 In the picture above, the mirror creates a beautiful statement piece against the white subway tiled wall with black grouting. 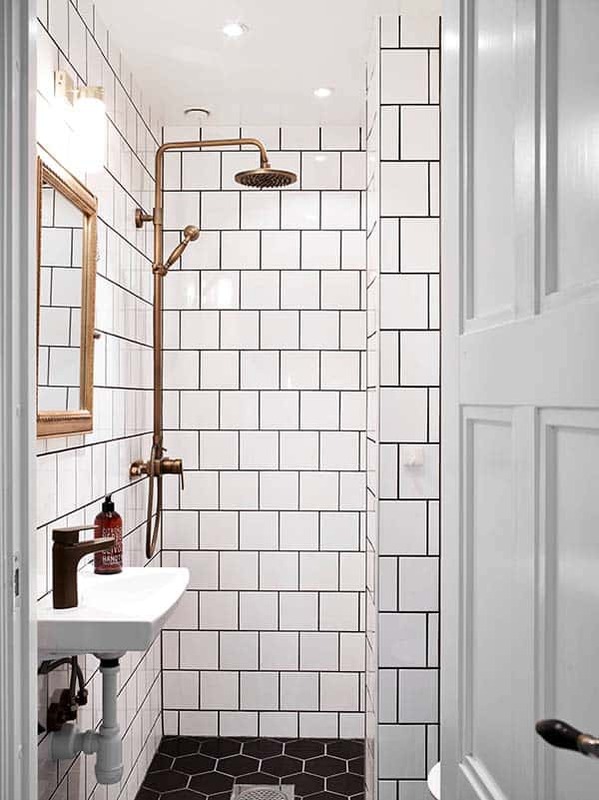 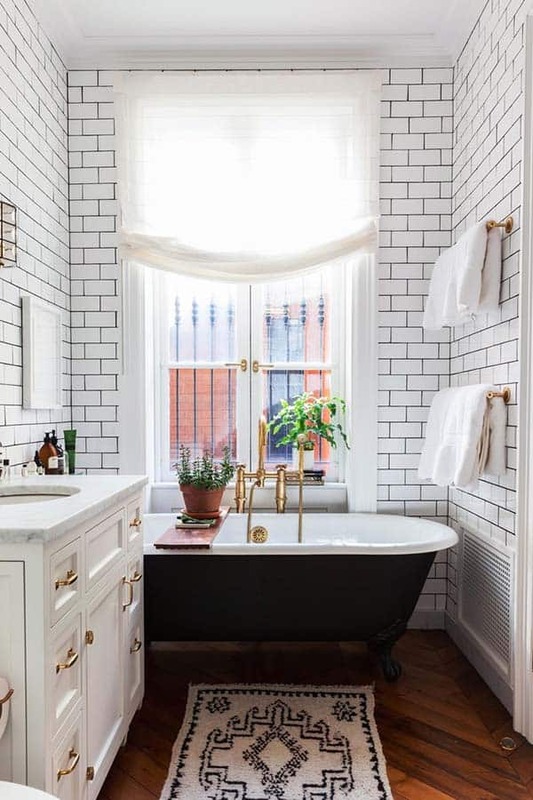 If you are looking to design white bathroom but feel like it might be too minimalist or contemporary, you can try infusing it with some vintage elements. 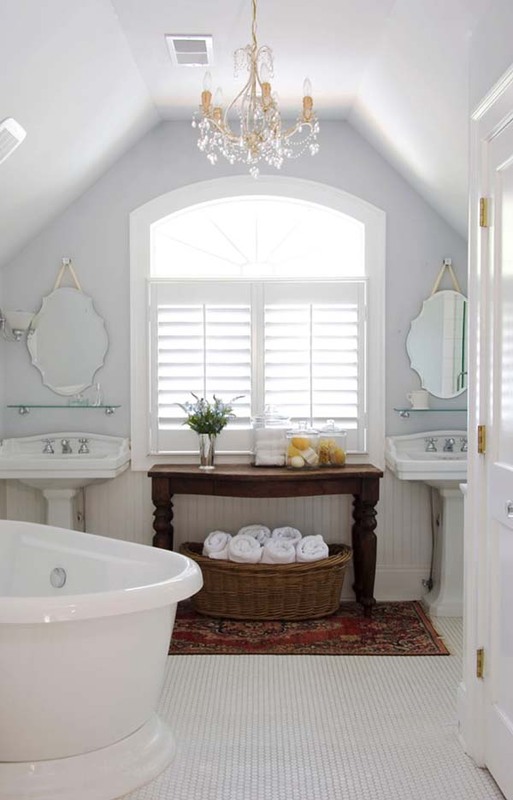 The sparkling white bathroom pictured above has a very clean color palette, yet the claw foot tub, pedestal sinks, large framed mirror and retro fixtures creates a very charming aesthetic. 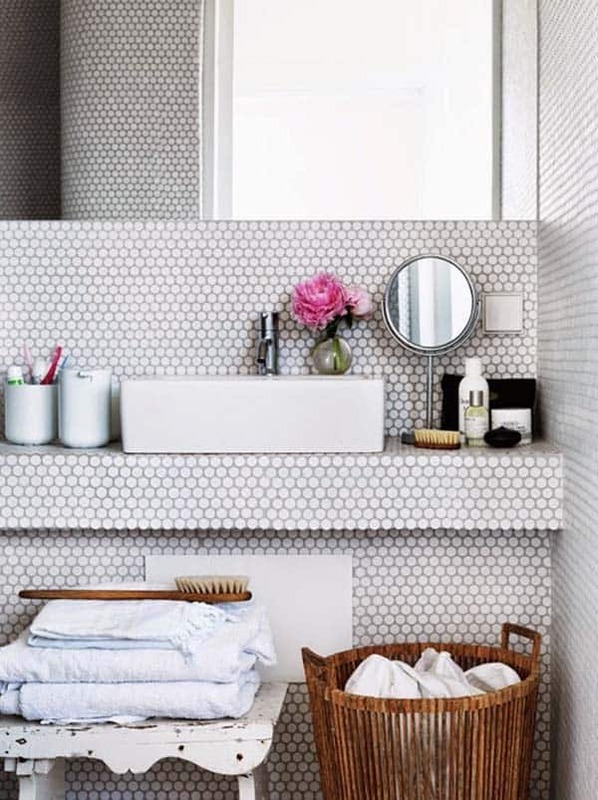 Infuse a white bathroom with a punch of color via colorful accessories such as a graphical printed shower curtain and floor tiles. 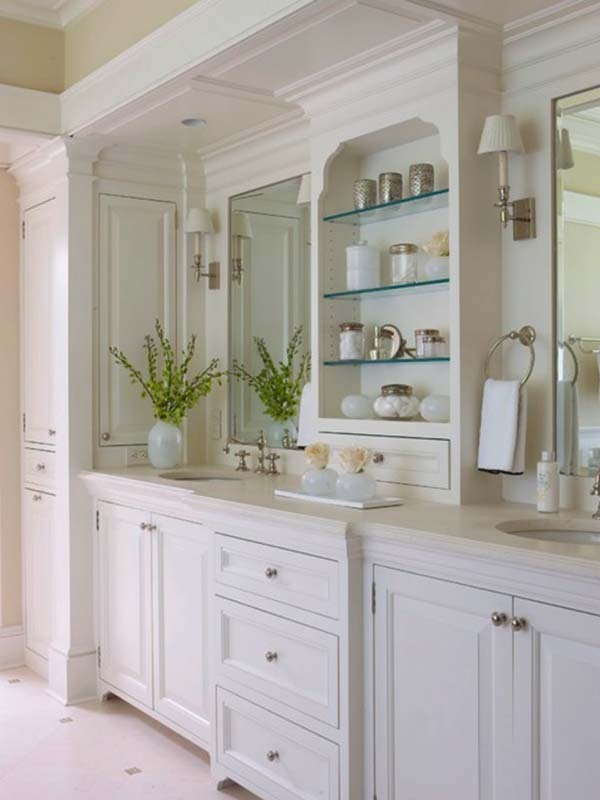 This traditionally styled bathroom in a New York home showcases classic lines and plenty of cabinetry for storage. 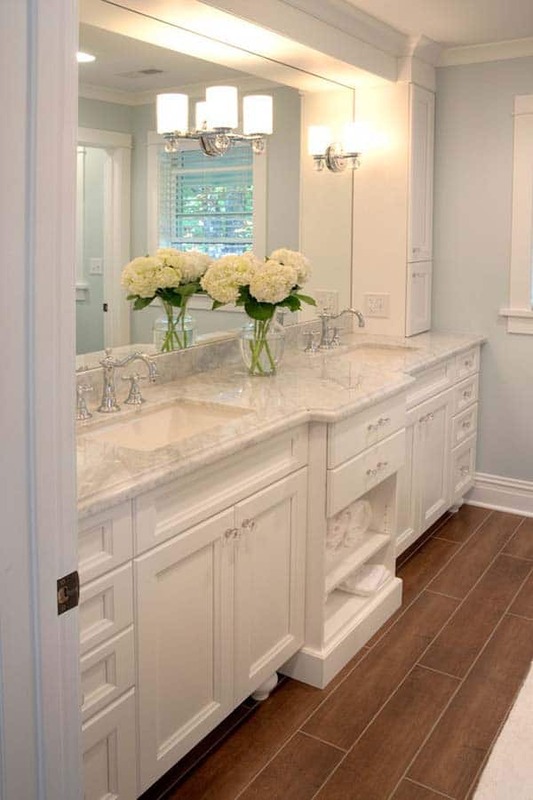 This impressive bathroom was awarded the winner of the bathroom category in Westchester Home Magazine for 2014. 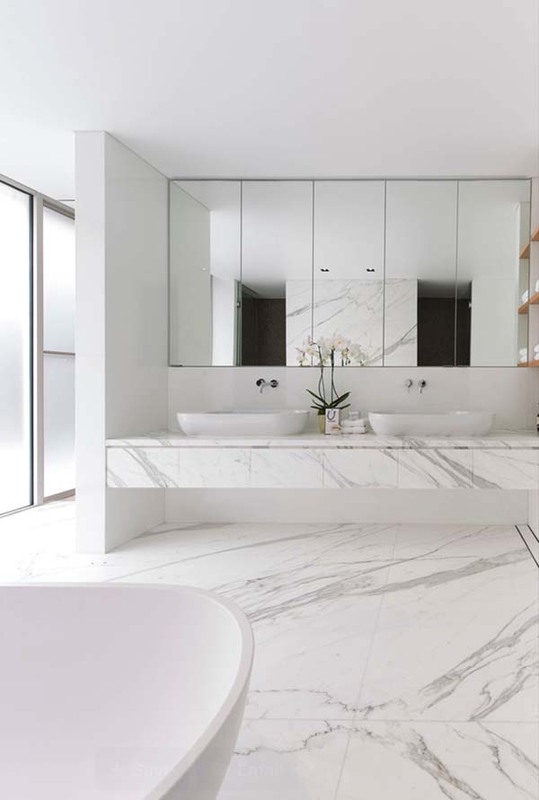 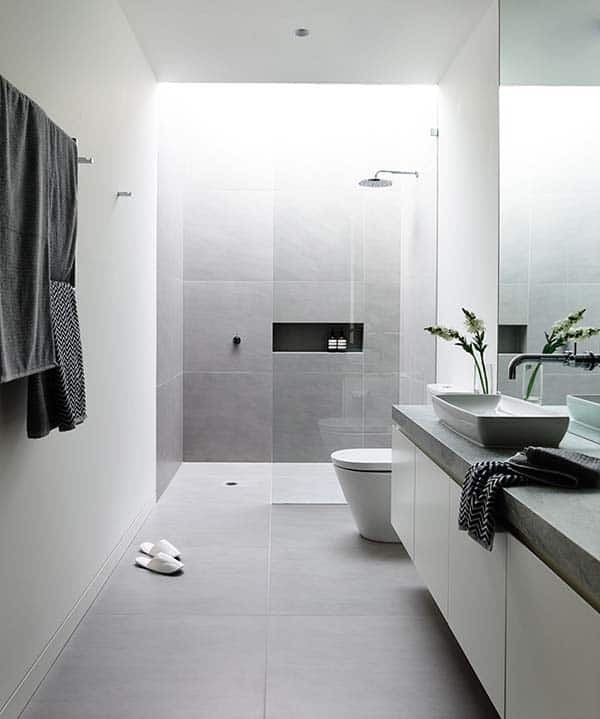 In this stunning contemporary bathroom, clean, smooth surfaces of the flooring and countertop creates a very pleasing aesthetic. 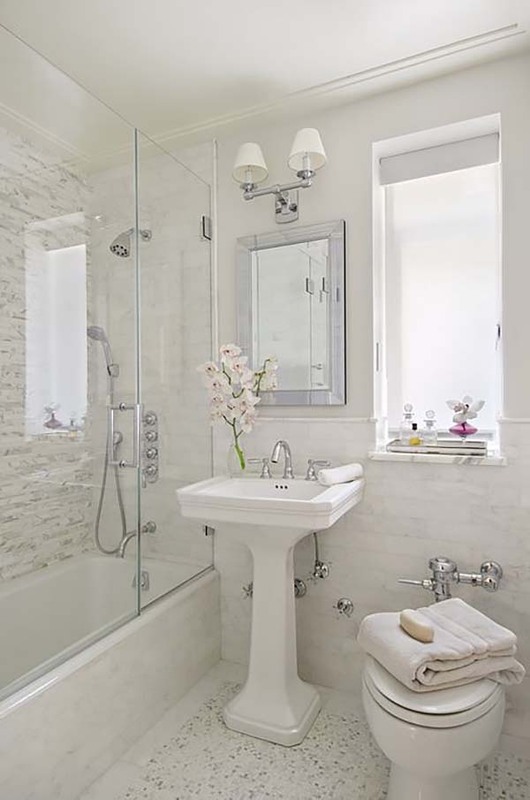 Despite their being a limited color selection, the warm white hues makes the bathroom feel not as cold and stark. 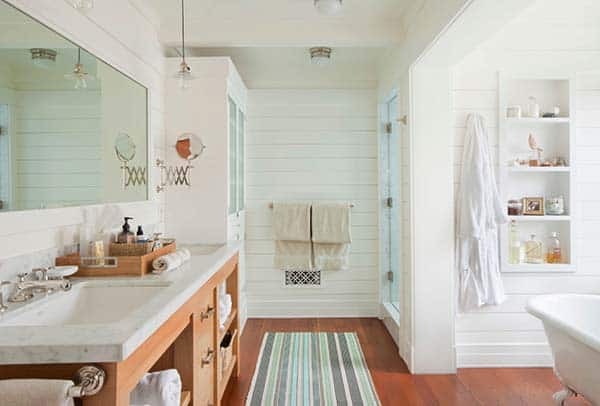 This inviting bathroom offers a spa-like feel with a soaking tub and glass-enclosed shower, the perfect oasis to unwind at the end of a long day. 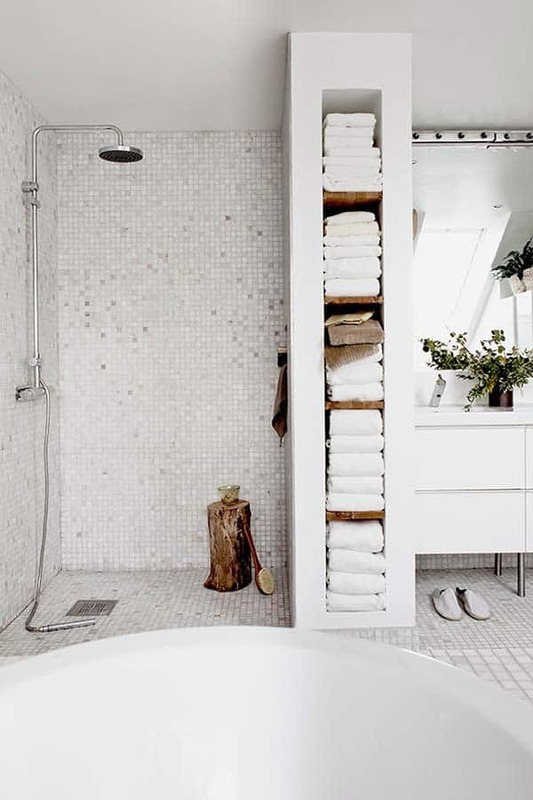 The space offers a pleasing combination of crisp white walls and warm timber tones from the flooring and cabinetry. 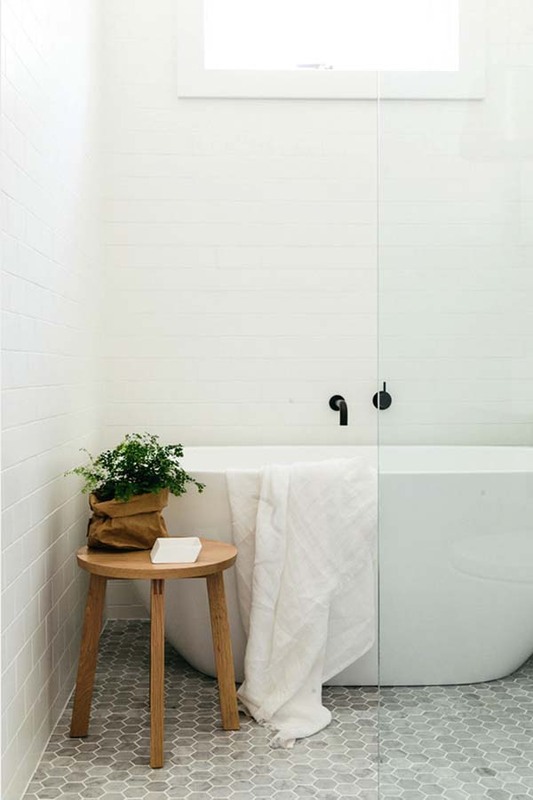 The open layout and sunlit interiors creates a nice feeling of spaciousness, peppered with elegant decor, this bathroom offers a welcoming respite! 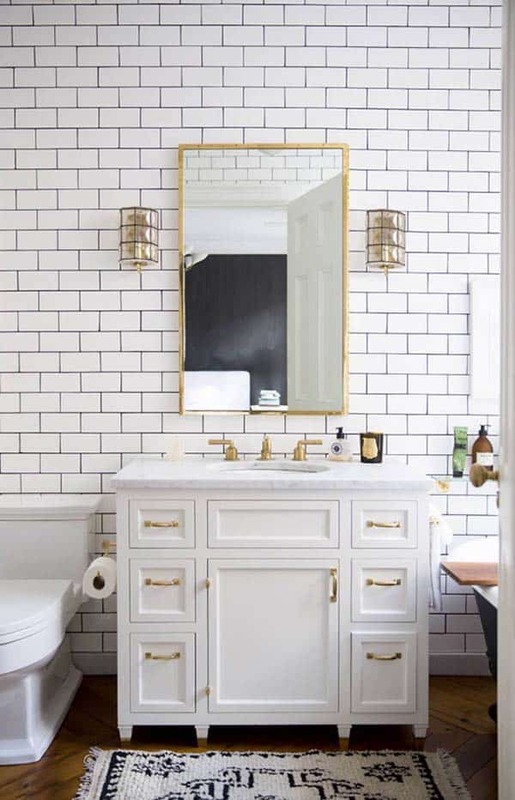 If you have interesting architectural details in your bathroom, try highlighting those elements with a white design scheme infused with light neutrals to create a dramatic impact. 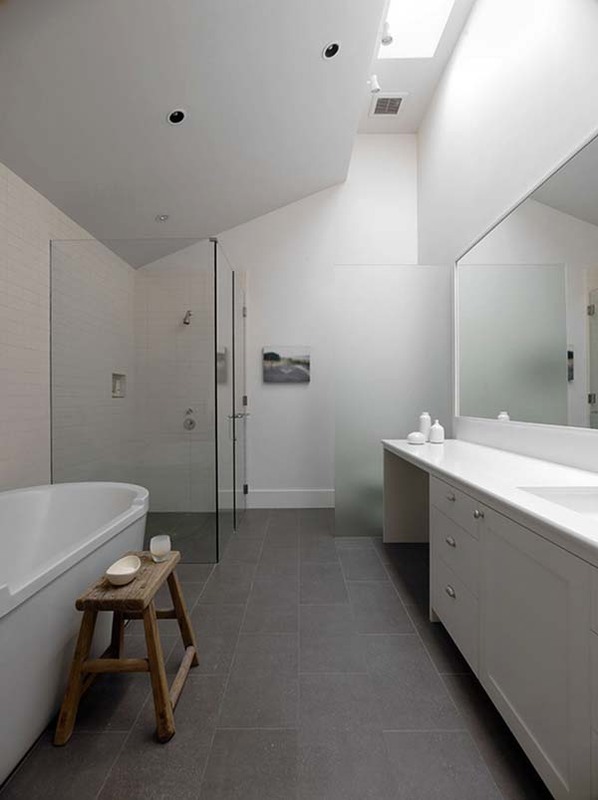 In the bathroom pictured above, you can see how the crisp white walls draws your eyes upwards to the sloped ceiling and skylight, which illuminates the space with natural light. 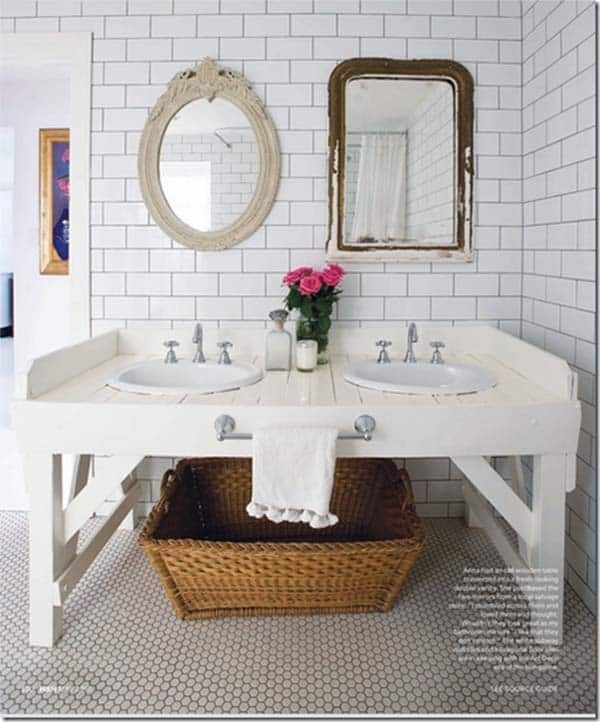 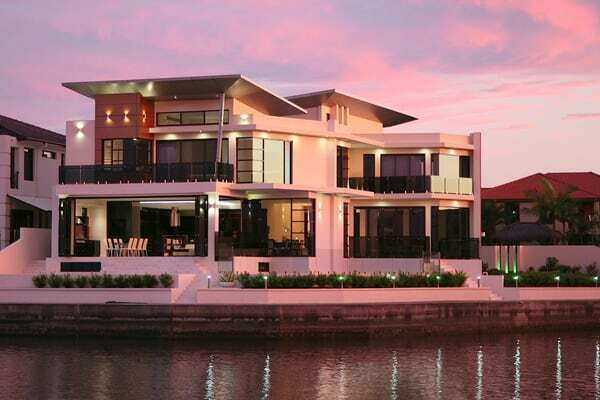 Who says white has to be boring? 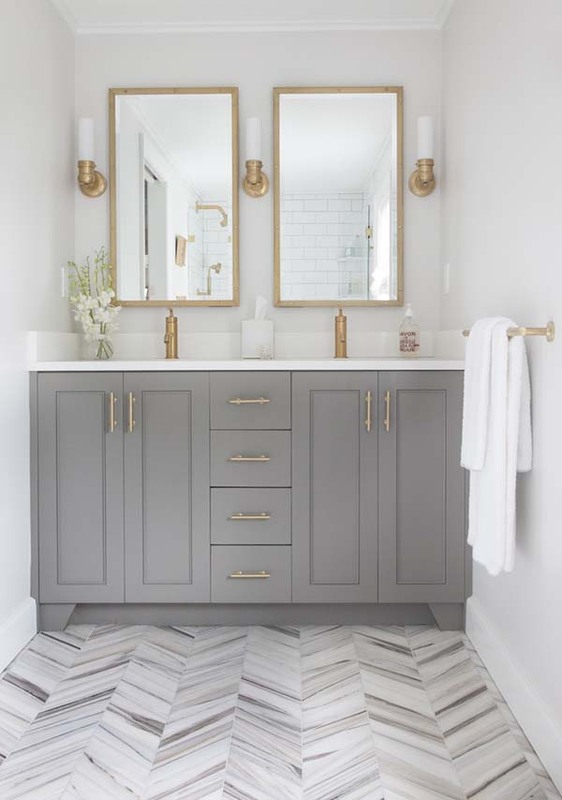 This mostly white bathroom gets dressed up with gold hardware, fixtures and accessories, gray cabinetry and herringbone flooring with a combination of gray and white. 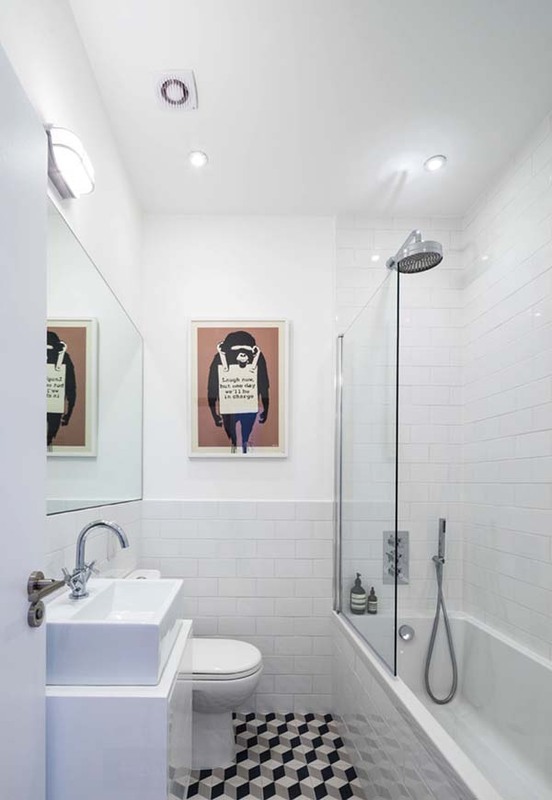 If you are lucky enough to have a large picture window framing your bathroom like the one pictured above, try keeping your space more simple and clean so that the view can take center stage. 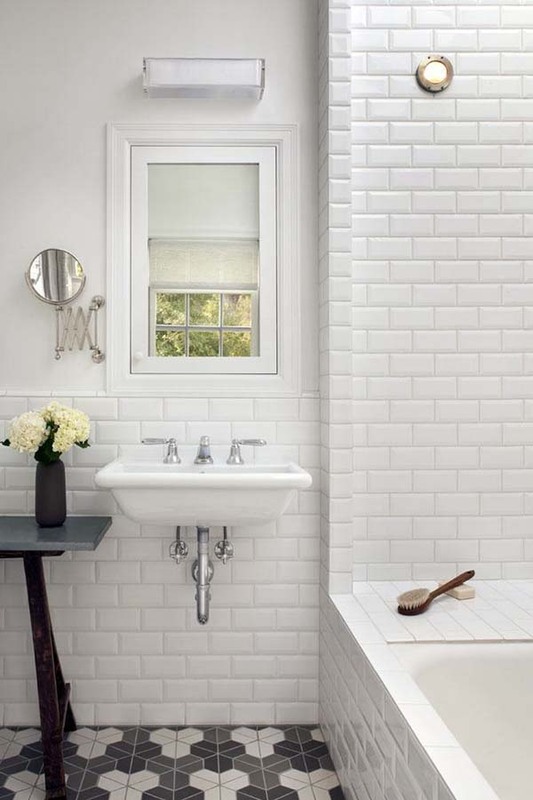 Another benefit to the large window is all the natural light glistening off your white walls, fixtures and accessories, creating a very luminous space! 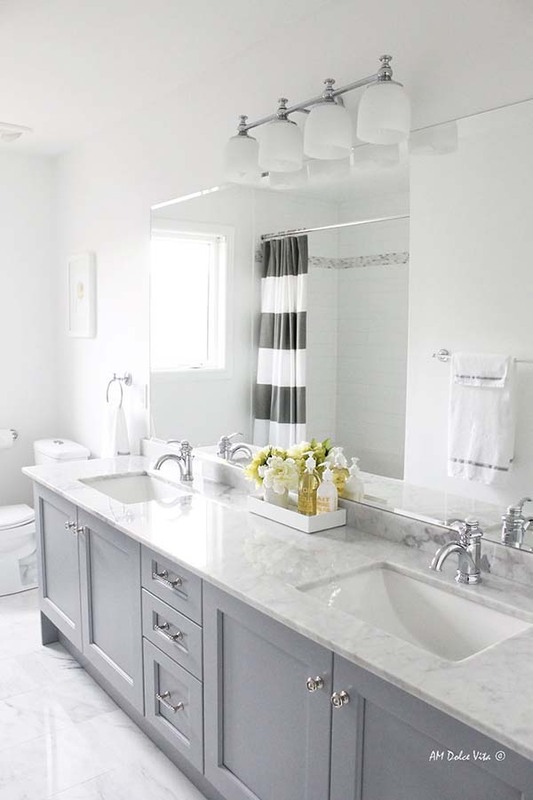 This a sparkling white bathroom is not the style taste of everyone, but even if you are not a total fan, you have to admit that the look is quiet appealing! 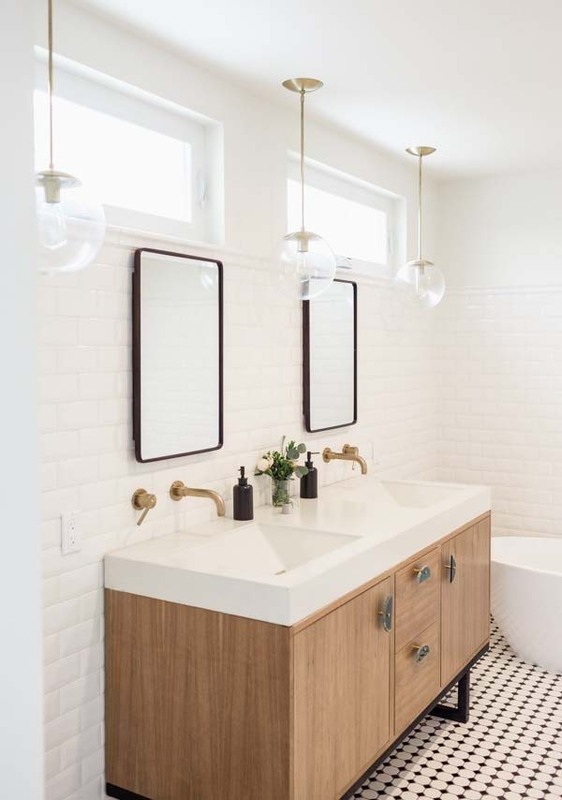 In the elegant bathroom picture above, you will see shiny surfaces such as the floor tiling and mirrors contrasting with matte finishes of the custom cabinetry and walls. 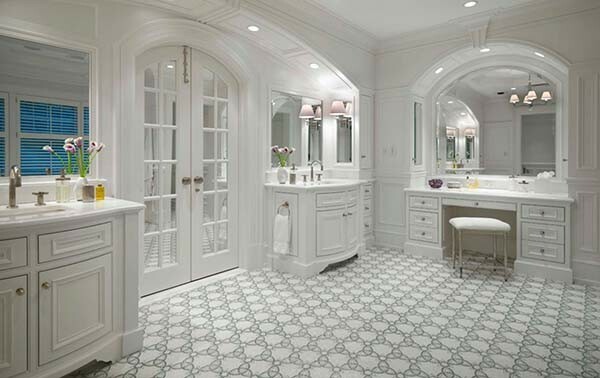 Architectural interest is abound in this space with the groin-vault ceiling and fluted moldings of the cabinetry. 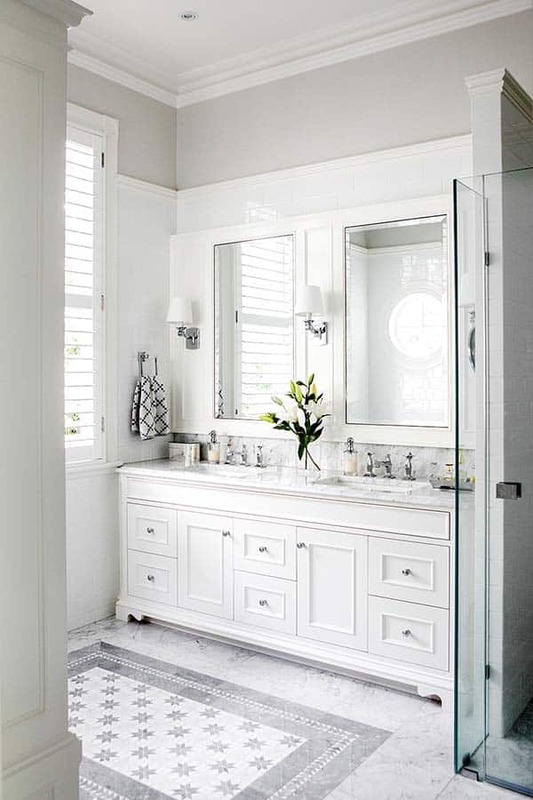 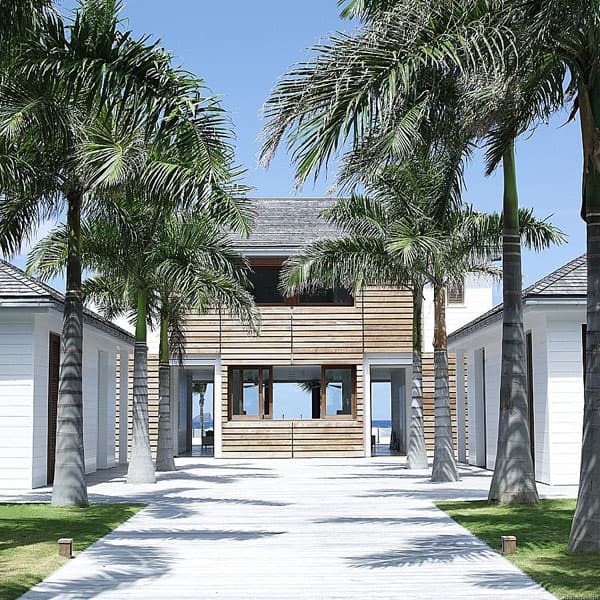 Silver accents in the fixtures, fittings and hardware adds high style glamour to the sea of white.